The Crock-Pot SCCPVL400-R, besides being a large slow cooker, also comes with a see-through, locking lid, perfect for transporting dips, soups, and stews securely. The crockpot has a convenient keep warm setting; the only issue we saw was the short cord. For a high-quality slow cooker with a sturdy, durable design, it’s a fair value. This programmable crockpot takes all the worry out of preparing meals. 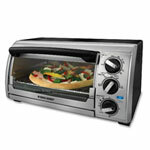 Its controls allow you to set the cook time from 30 minutes to 20 hours. The sturdy handles allow you to carry it easy. We especially liked the way the lid locks on with a rubber gasket to prevent spills, and the crockpot automatically turns to keep warm setting when it’s finished cooking. One special feature of the Hamilton Beach 33967 is the probe setting, which monitors and displays the temperatures of large meats, so you’ll be sure to cook it to perfection. Other convenient features include a locking lid and a serving spoon clip on the side. Both the stoneware and the tempered glass lid are dishwasher safe. This sleek black and stainless steel slow cooker from Hamilton Beach has a curved handle wrapping around the sides that stays cool to the touch. It’s large enough to serve meals for a large family, for instance, a five-pound chicken. 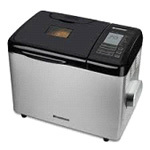 Designed for durability and ease of use, the Hamilton Beach 33141 is also highly affordable. An extra-large slow cooker with a polished stainless steel exterior, the Crock-Pot SCVT650-PS has silicone-wrapped handles that stay cool to the touch. Its 6 ½ quart crock can prepare roasts or stews for up to 8 or 9 people, making it especially handy when you have company. The touchscreen controls are easy to program, and it comes with a bonus cookbook. With a homey design and a colorful floral pattern, the Hamilton Beach 33139 keeps everything simple for you, from its basic dial to its easy-grip handles. 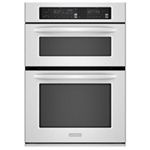 Both the 3-quart stoneware crock and the glass lid are dishwasher friendly, keeping cleanup effortless. This slow cooker makes generous portions, perfect for the average-sized family or those who like leftovers. With a snazzy black-and-white damask pattern, the Crock-Pot SCR450-PT will add some pizzazz to the kitchen as well as tasty stews and roasts. With a crock capacious enough to feed five or more people, it’s also easy to clean simply by putting it in the dishwasher. As an added bonus, it comes with a recipe book of slow cooker meals. 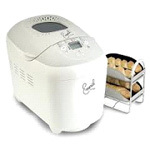 A miniature crockpot ideal for smaller households, the Crock-Pot SCR300SS has simple settings: Low, High, and Warm. It handles chilis, stews, and small roasts with ease, and cleanup is a breeze with the dishwasher-safe stoneware and lid. If you’re looking for a reliable, no-frills crockpot, housed in an attractive stainless steel, then this one is ideal and affordable. This 3 ½ quart slow cooker has 4 convenient settings: High, Low, Warm, and Simmer. Conveniently, the Cuisinart PSC-350 automatically switches to the keep warm setting when the cook time is finished, so you can come home to a ready meal. The warm setting then switches off after another 8 hours. The size of this slow cooker easily accommodates families of 2 to 4. The Proctor Silex 33015Y is perfect for small households, with a 1 ½ quart crock that can make small roasts, soups, sauces, and stews while you’re at work. The simple dial has 3 basic settings: Low, High, and Warm. An affordable, non-fussy slow cooker that’s easy to clean, this crockpot would make a great gift for a student or a couple. Crock Pots, or slow cookers as they’re generically known, are incredibly handy appliances because you can add all the ingredients in the morning, go to work, and come home to a nice hot meal that evening. It does all the hard work for you, and meats turn out tender and juicy. So what should you look for in buying a Crock Pot? Size is an important factor. Think about how many people you have in your household when shopping for a slow cooker. Oval or round crocks—the shape is not that important, although some people believe oval crocks fit long roasts easier. Just make sure the interior is rounded for easy cleaning. A removable crock is essential. It will allow you not only to lift it out of the heating element to use as a serving dish, but you can store the leftovers in the fridge and wash it in the dishwasher. Another key feature to have is a glass lid. Not only do you want to see how the slow cooking process is going, but glass will hold up better against the heat over the years than plastic will. Price ranges from $20 up to a couple hundred dollars. You don’t need a whole lot of fancy features, although some people like having the options of programming the slow cooker to change temperatures. One particularly nice feature is automatically switching to the keep warm setting after the crock pot is finished cooking. That way, even if you get held up, your food will still be ready for you when you get home.